Have you been shopping for new appliances? Specifically, a new refrigerator? If you like in Arkansas, you’re in for a real treat. 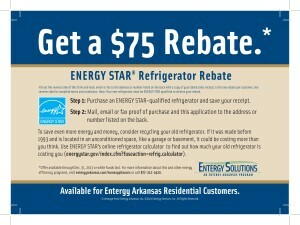 You can get a $75 rebate with this ENTERGY ARKANSAS RESIDENTIAL CUSTOMER REBATE COUPON. 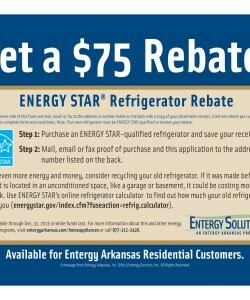 If you purchase an energy star-qualified refrigerator and mail, email or fax your proof of purchase, you will receive a $75 dollar check. Now that sounds like a plan. Even if you had planned on getting a new refrigerator, this is even more of an incentive, don’t you think? And you will be doing your electric bill a great service by purchasing an energy efficient model. I’d say it was a win-win. It’s great when energy companies take the time to reward their customers for being energy-conscious. Updating your appliances with new ones will save you tons of money in the long run, and you will probably see some initial savings as soon as you start switching out appliances. Entergy Arkansas has the right initiative in mind. They are also recommending you recycle your refrigerator. If they are giving you tips, you should keep them in mind. It’s not every day your energy company takes the time to actually give back instead of raising rates. Let’s applaud them. And knowing that the winter months are ahead, it should be a relief to know that some of your electrical bill will be lower. Those savings can definitely transfer over into your heating bills. As time goes on, I’m sure they will offer additional incentives on other appliances, encouraging your home to become an energy efficient place to be. That’s definitely something you should be considering in the future. Its all about saving energy, lowering your bills and working on the environment.